Electromechanicals & PCs - Don't Be Shocked! Today’s manufacturing facilities contain a blend of old and new technologies. Advanced sensors, lasers, motion control tables, and machine vision systems are used in conjunction with the workhorses of the industry – solenoids, coils, relays, and primary logic controllers (PLCs). While this modern technology can improve workflow efficiencies, it also brings new challenges to the table. Mixing the old with the new requires careful consideration, especially when industrial PCs are part of the installation. All of these devices rely on electricity, but their power needs vary. Some demand clean power that’s well-regulated and free of noise and transients, while other devices actually produce power pollution, such as RF and transient voltage noise and spikes during use. While this sounds complicated, knowledge of a few general concepts and industry best-practices will keep your machines running predictably and trouble-free for years to come by helping you recognize problematic situations and identify how to mitigate them. What Are The Key Power Challenges? With the aim of simplifying wiring and containing costs, the power supplies providing electricity to industrial PCs are often asked to do more than they are designed to handle. In many instances, a single power supply is being used to power computers on top of the electromechanical devices they control or monitor, such as solenoids and motors. While the industry best-practice encourages isolation between all sensitive electronics (i.e. computers) and noisy electromechanicals through the use of separate power supplies, the reality is that systems (and their power supplies) are underperforming, being damaged, or end up smoldering as a result of neglecting this standard. Without this separation, PCs are at high risk due to the unnoticed (but prevalent) back-EMF voltages generated by inductive coils and solenoids within electromechanical devices, even when the input to those coils is considered “low voltage.” To complicate things even further, these events are too fast for people to notice and measure with regular metering equipment. An expensive oscilloscope is actually required to witness the wrath of coil discharge. Electromechanical switches and solenoids use electric coils to move a piece of metal to open and close a valve or switch with a magnetic field. When an energized coil is de-energized, this magnetic field collapses and releases a transient voltage spike in the opposite direction as it happens. This is called “back-EMF” or “flyback”. What’s important to note is that even if the input voltage is considered low, these low voltages can generate hundreds, even thousands of volts momentarily upon collapse. How does that work? 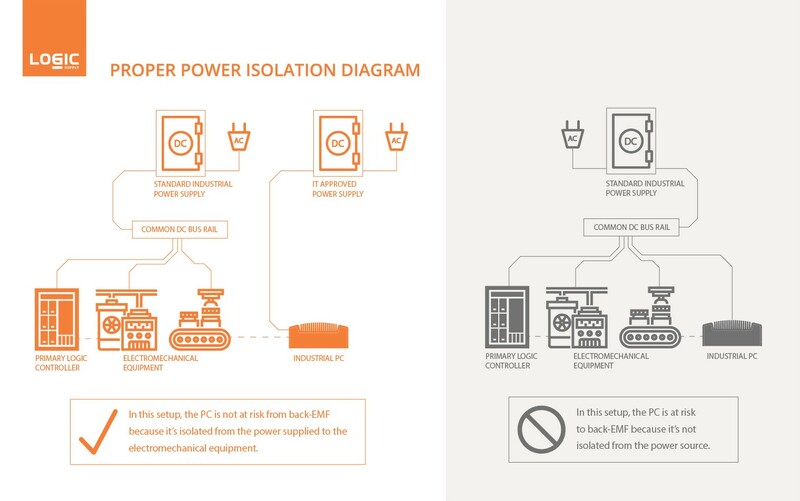 This illustrative example shows the industry best-practice for power isolation. We’ve established that when a coil is powered, the energy runs through the coil and creates a magnetic field. But for every loop that energy must pass through in the coil, the potential collapse voltages that will be created as a result are multiplicative. A coil with 24v input can easily produce transients in excess of 300 volts or more in the millisecond or microsecond time span when depowered. Larger coils can produce significantly more. That’s a lot of bite for a little bark and more than capable of destroying silicon junctions if not properly suppressed. Today’s computers are designed to handle Electrical Fast Transients (EFT) in order to pass immunity standards, such as EN 55024. But these voltage inputs are typically 500 or 1,000 volts for short bursts. Prolonged or continued exposure to these bursts can degrade the dielectric performance of power components and result in damage to the power supply and other components. Are You At Risk? What To Watch Out For And What To Do About It. Does your application have motors, air valves, solenoids, or relays? If so, then your application may be at risk if these devices are sharing a power supply with a sensitive electronic device, like a computer. And if your power supply isn’t rated for use with IT equipment, it could also be putting your system at risk.